Crumbling Stability In the past few months, we have witnessed a series of defining events in modern political history, with Britain’s vote to exit the EU, (several) terror attacks in France and Germany, as well as the recent attempted military coup in Europe’s backyard, Turkey. Global stability continues to be undermined Uncertainty over Europe’s political stability and the future of the EU keeps growing. These worries are quite valid, as geopolitical developments have the potential to shake markets to the core. The current high-risk environment makes it especially important to take prudent investment decisions in order to protect one’s wealth. Helicopter Hopes Markets have greeted the rumors of helicopter money with intense enthusiasm, beginning with Ben Bernanke’s visit to Japan. This is a symptom of the economy’s addiction to loose monetary policy and “something for nothing” fiscal remedies. 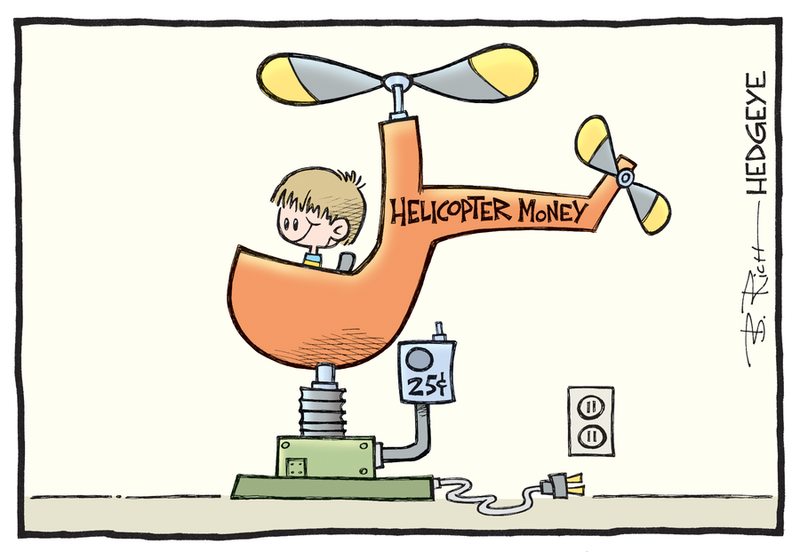 Helicopter money, the next evolutionary stage of QE, is the manifestation of the failing, yet persistent, monetary policies adopted and enforced by modern-day central bankers. This time, their proposed solution for rescuing an economy that flatly refuses to get back on a growth track (despite a long series of aggressive interventions), is a direct and permanent injection of newly printed money into the economy, by circumventing the banking system completely. In the past few months, we have witnessed a series of defining events in modern political history, with Britain’s vote to exit the EU, (several) terror attacks in France and Germany, as well as the recent attempted military coup in Europe’s backyard, Turkey. Uncertainty over Europe’s political stability and the future of the EU keeps growing. These worries are quite valid, as geopolitical developments have the potential to shake markets to the core. The current high-risk environment makes it especially important to take prudent investment decisions in order to protect one’s wealth. Markets have greeted the rumors of helicopter money with intense enthusiasm, beginning with Ben Bernanke’s visit to Japan. This is a symptom of the economy’s addiction to loose monetary policy and “something for nothing” fiscal remedies. Helicopter money, the next evolutionary stage of QE, is the manifestation of the failing, yet persistent, monetary policies adopted and enforced by modern-day central bankers. This time, their proposed solution for rescuing an economy that flatly refuses to get back on a growth track (despite a long series of aggressive interventions), is a direct and permanent injection of newly printed money into the economy, by circumventing the banking system completely. The idea is that this measure will succeed, where QE failed: This time, the consumer will be reached directly and the funds will not remain trapped within banks and institutions. Therefore, so the thinking goes, the money will be spent, demand will inevitably be stimulated, economic growth will be boosted, and the price inflation targets of central banks will finally be reached. Even if such an irresponsible and desperate move does end up boosting economic activity in the short term, its long-term consequences are certain to be deeply detrimental. By default and by design such an action cannot be reversed, and will only corrode the already unsound foundations of the economy further. Will Dissatisfied Voters Reshape the Political Map? Ever since the creation of the EU, and the adoption of Brussels’ vision of full integration, the assumption was that the logical next step would be a move toward complete unification of member states into a single European superstate. That was indeed the plan – until the Brexit shock. Every action has a reaction, and we have yet to see Brussels’ reaction to Brexit. It will either drive a transformation into a federalist structure, or intensify the centralization of the union, which is bound to fuel nationalist sentiments across the continent further. These are particularly strong in the wake of recent terrorist attacks in France and Germany (as we discuss in our article on the rise of the Right in the latest Global Gold Report). This is not limited to Europe, as voters everywhere are dissatisfied with their leaders. Governments will fall; we just don’t know which ones yet. Marine le Pen, Donald Trump, Alexis Tsipras, Pablo Iglesias: regardless of whether voters are drifting to the right or the left of the political spectrum, the increasingly evident failure of welfare/ warfare statism has greatly boosted the appeal of populist politicians and their movements. Unfortunately, this will likely lead to even more statism. As the U.S. elections draw closer in November, we do not know how the vote will turn out, and in what direction either candidate will take the U.S., both politically and economically. The world’s financial system is at a dead-end, inherent in its own design. As we explained before, the petrodollar system that made the dollar the global reserve currency was intended to create artificial demand for dollars that would fund a persistent current account deficit. Global dollar supply was fortified through oil imports. Economist Robert Triffin argued that the United States could not guarantee that the current account deficit and with it the global supply of dollar would be sustained indefinitely. Eventually this perennial imbalance was apt to trigger a worldwide economic contraction. This is exactly what has happened after the recent oil price slump got underway. A major cause of the price decline was the boom in America’s fracking industry, which has made the US less dependent on oil imports. The current account deficit contracted and fewer petrodollars entered the global economy. Ironically, the U.S. has unwittingly ended up self-sabotaging the system that was designed to ensure its economic and political supremacy. This validates the views of Ron Paul and others (lately even Alan Greenspan agrees): a return to the gold standard is the only viable solution to the woes of our financial and economic system. 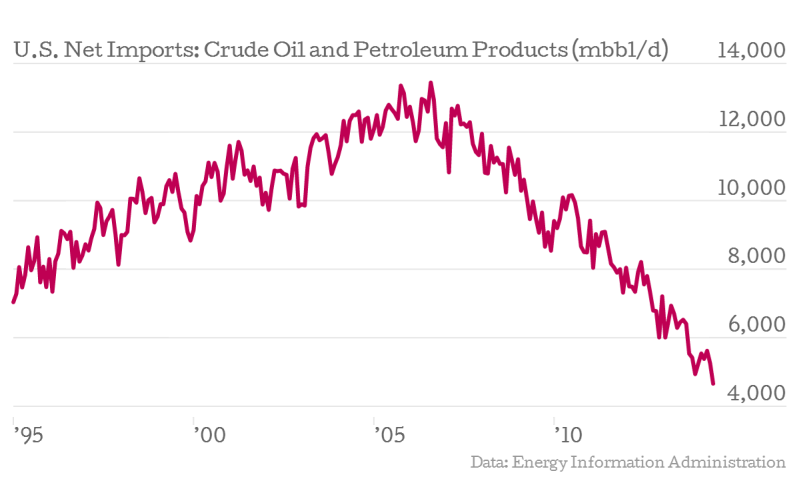 Net US oil and petroleum product imports have declined to a 28-year low – click to enlarge. Public dissatisfaction with governments is a direct result of their failure to meet expectations or actually keep their promises after the 2008 financial crisis. Instead of fixing the root problems, more money is pumped into the economy and markets at full speed. Investors were happy to see the stock markets boom, but they are insanely overvalued again. According to Prof. Robert Shiller, who devised the cyclically adjusted price/earnings ratio, is now exceeding the level of November 2007, just after the pre-crisis peak of the U.S. stock market. It currently stands more than 50% above its average since 1871, as the chart below illustrates. Meanwhile, the U.S. bond market has reached record high price levels as well. My friend the German economist Thorsten Polleit has created a measure comparable to Prof. Shiller’s CAPE ratio which he applies to the U.S. bond market. The ratio reflects the number of years it takes for interest income to return the amount of money that an investor has paid for a bond. The higher a bond’s “price-earnings ratio”, the greater the risk borne by the investor. Back in 1872, the “bond P/E ratio” was at 20, by now it has reached the rather stunning level of 70. The Shiller P/E ratio (a.k.a. cyclically-adjusted P/E or P/E 10) is measuring earnings over a ten-year period so as to eliminate the influence of short term cyclical income fluctuations. Its current level of 26.6 was only exceeded in the run-up to the peaks of 1929 and 2000., i.e., it indicates that the stock market is extremely overvalued. The historical average is 16.7, but the ratio tends to oscillate wildly between overvalued and undervalued levels – even readings in the single digits have been recorded regularly in the past – click to enlarge. The Wall Street Journal writes that “investors are more funereal than enthusiastic” (back in 1996 Alan Greenspan described their enthusiasm as “irrational exuberance”). Investors are cornered in an unfriendly and unhealthy environment, with economic contraction barely held at bay, interest rates in negative territory, and worries about the future of China and the EU. There seems to be no real escape route. Consider the immediate reaction of investors to Brexit: the British Pound collapsed against the US dollar to its lowest level in 30 years. Stock markets sold off sharply, while the gold price shot up by almost 4% on June 24. This shows how nervous investors are, even though at least the trend in stocks has since then reversed sharply, in anticipation of even more central bank stimulus. 2016 has so far been one of the strongest years for gold, as it has rallied by about 25%. It is still widely held though that gold is merely in a bear market bounce and the price decline is set to resume. 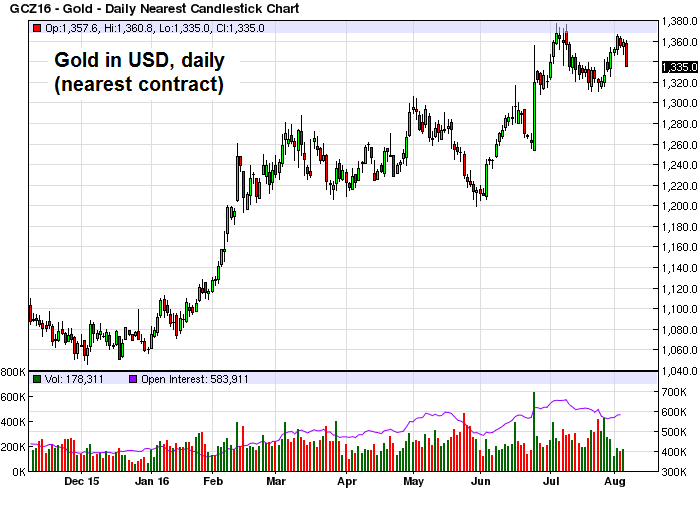 We believe this is a very short-sighted view – gold’s secular bull market has not ended yet. What one needs to consider is the future, and the future is currently riddled with a lot of uncertainty. What we do know for certain is that growing negative sentiment toward governments that have failed the citizenry both politically and economically, means that there is a need to safeguard wealth from the turmoil that lies ahead. If you haven’t included gold in your portfolio yet, now is the time to do it.